To edit portfolio name, use the "Edit Portfolio" button in the toolbar. You can only edit the name of the portfolio. 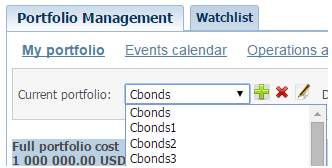 To delete a portfolio, select the respective portfolio from the drop down list and click "Delete".